TEENAGE MUTANT NINJA TURTLES: OUT OF THE SHADOWS the perfect film for a family movie night! & FREE Shipping on orders over $49. A fun Halloween clip where Mikey joins the NYC Halloween Parade! 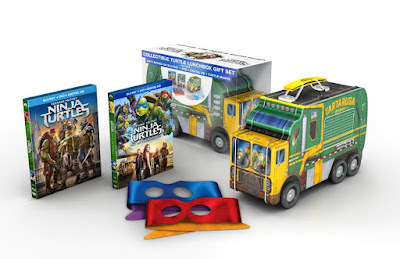 One lucky reader (US only) will win the The Teenage Mutant Ninja Turtles Gift Set, which has a collectible Metal Turtle Truck Lunchbox that could be used for Trick or Treating and 2 Double-sided Ninja Masks (all four turtle colors) that can be used for costumes, as well as both TMNT films- Teenage Mutant Ninja Turtles Blu-ray Combo Pack and Teenage Mutant Ninja Turtles: Out of the Shadows Blu-ray Combo Pack. Disclosure: I did not receive anything for this post.